Festival Report - Janmastami Celebrations! ~ The Toronto Hare Krishna Temple! Festival Report - Janmastami Celebrations! Janmastami Celebrated in Grand Fashion at Toronto Hare Krishna Temple! On Saturday, September 5th, the Hare Krishna Temple celebrated the biggest birthday bash of the year, Sri Krishna Janmastami. This is one of the most auspicious days in the Vaishnava calendar as it marks the birthday of Lord Sri Krishna. As the guests started pouring in from all over the Greater Toronto Area, the festivities began with more enthusiasm than ever before. In the evening there were many performances, bhajans and lectures given by many devotees. During the festivities a beautiful abhisheka (bathing ceremony of small Deities) was performed with an ecstatic kirtan by the Radha Murari group from ISKCON Scarborough. Following the abhisheka, Bhaktimarga Swami put on a brilliant play highlighting all the wonderful qualities of Lord Krishna. All the performers received rave reviews from the audience with a thunderous applause. 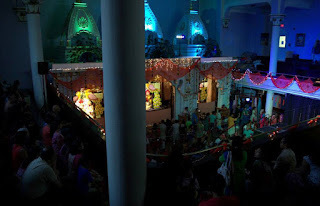 The mood was set and all the devotees were eager to see their Lordships Sri Sri Radha Ksira-Chora Gopinatha for the annual tradition of the special midnight darshan! When the clock struck midnight, the doors opened to reveal the gorgeous Deities of Sri Sri Radha Ksira-Chora Gopinatha, decorated in their dazzling flower outfits! All those gathered enjoyed this joyous occasion by popping balloons, having a shower of flowers and singing their hearts out for the kirtan. This was truly the biggest birthday bash of the year, and it is marked by the excitement that still lingers in the air. Hare Krishna!